In the interest of full disclosure, I feel a need to confess, dear readers, that in one of my former lives, I was a bar-tender at a resort in rural Montana. All I can say is that a girl learns how to make a good margarita out there! Caution: this is not a drink for the faint of heart – these margaritas will ROCK you if you’re not careful – but they sure go down easy! Take one of the lime wedges, cut a slit in it with a sharp knife, and use the slit to rub lime juice around the rims of 4 glasses. 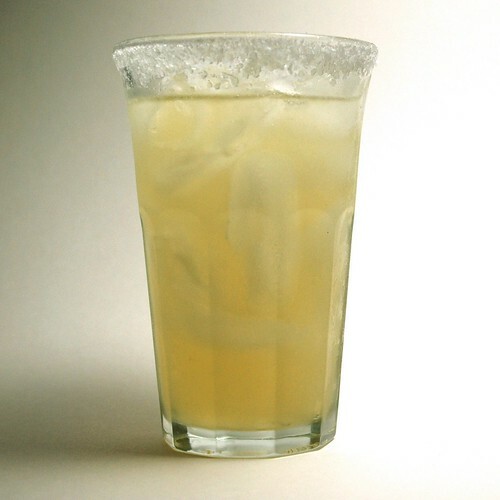 Dip the rims of the glasses into the margarita or kosher salt to coat. Fill the glasses with ice cubes. Place more ice cubes in a large pitcher. Pour the beer, lime-aid, water, and tequila into the pitcher. Tip: you can use the empty lime-aid can to measure the water and the tequila. Then add the orange liqueur and the orange juice. Mix well with a long spoon, and pour into the prepared glasses. Garnish with the remaining lime wedges. Enjoy!! !